Which vessel you will finally decide on is totally up to you. What we can do is assist you by guiding you through the process. We have a lot of experience and will gladly connect you with shipyards and answer any queries you might have. Why opt for buy & charter? The revenue from chartering your yacht will help you to finance and maintain it. Ultimately this will help you to fulfil your dream of,... your own boat. Professional maintenance and care by specialists guarantees the stability of your yacht’s value. As owner you have a number of weeks during which you use theboat yourself. The yacht is your property, but you do not have the work that comes with owning it. These advantages show clearly why this method is gaining in popularity. Funding of your yacht through a Croatian Bank. Leasing of your yacht by you or your company to a Croatian service company. Contribution of your yacht in a Croatian company. We can consult you on any of these variations due to our long-standing experience and help you chose the right programme. The owner is entitled to use the boat for up to 4 weeks, taking into consideration the current booking situation. When agreed upon with the booking office, a longer period of self-exploitation is possible. The financial arrangement for the weeks of self-exploitation depends on the charter programme you chose. Depending on the financing model, charter revenues pay for the leasing rates, mooring, insurance, Croatian fees, service charges for continuous maintenance, storage during winter, spring servicing etc. With the model „renting out“ the owner charges a fixed rent. Offering one’s own yacht for charter is a matter of trust. This is why you need to examine very carefully in whom you place your trust. The owner should always be made part of the partnership. This resulting teamwork will well and truly contribute in the successful chartering and value upkeep. Having been on the charter market for over 25 years, we know the ins and outs, so you, the owner, as well as the charter guests feel comfortable and happy. A highly competent and informed technical team, that is up-to-date with the technical advancements on motors, electronics i.e. autopilot, GPS, radar etc. The maintenance staff undergoes direct training by the shipyards specialists. These requirements have helped us grow our fleet of owned yachts over 300. Our 10 charter bases in Croatia offer top service, so owners as well as charter clients have a hassle free and fabulous sailing holiday. Our office has been working with a large European network of agencies for 25 years.This guarantees an optimal use of capacity for your yacht. You, the owner, will receive 15% commission, if you act as agent for your or someone else’s yacht. Chartering revenues will be paid to the leasing bank or owner on the 10th of the following month. All owners receive an annual performance revision at the end of the year. Yachts that are part of the Pitter charter programme, are third party insured, have full comprehensive coverage and are insured against charter cancellation. As owner you may also take out other package insurances, at lower prices. Signed contracts can be cancelled every year. We do recommend, for economical reasons, not to terminate during the first 6 to 7 years. We will provide you with documents that list yacht equipment, as what we see as best example. This list includes the standard and must-have inventory for your yacht. The models and brands are your own choice. We are happy to organise any further equipment, at reduced prices. A well-equipped yacht will of course increase its use to capacity. We are happy to provide you with a non-binding offer. Croatia is a preferred nautical tourism destination, especially the Dalmatian coast. Due to the good transport connections, arrival is easy and comfortable either by car or plane. 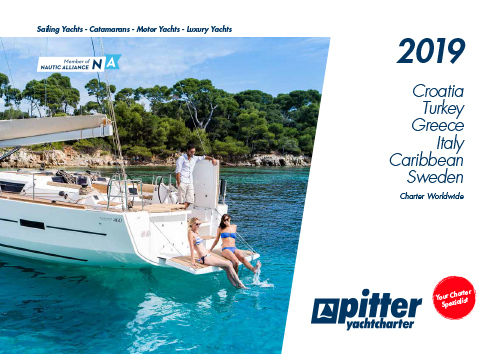 Pitter Yachtcharter operates from its bases in Veruda, Biograd, and 2x Trogir. With our partner bases at Zadar, Sukosan, Murter, Sibenik and Split, we practically cover the entire Croatian coast. If you decide to no longer charter your yacht, we can still continue our partnership. We can take over the responsibility of caring for, servicing and repairing your yacht. You may continue to fall back on our knowledge, the competence of our specialists and our extensive spare parts warehouse. Precise and transparent bills will give you an exact overview of our dealings. We will also gladly be at your disposal in case you wish to sell your yacht.